One of the beauties of this bannering effort is that it can be done by activists that live in tiny towns, far away from other activists. If you would like to do this where you live, don't worry that 8/19/09 has come and gone. Just do it any weekday when you can, and make sure to send us a report and description of your experience to davidslesinger@yahoo.com. 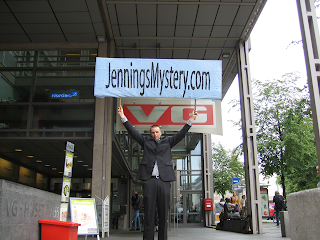 The reason we ask that your banners and flyers only contain the text "JenningsMystery.com" is that we believe any extra info will decrease the chance they will visit the webpage. 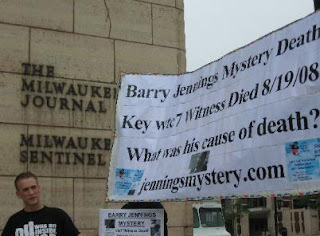 Nevertheless you are free to do want you want, but please do not say Jennings was murdered because we do not know that, and it sets us up for a fall if it turns out he died of natural causes. The key is that his testimony conflicts with the official story. Anne Johnson (Cedar Falls, Iowa): Well, that was fun! 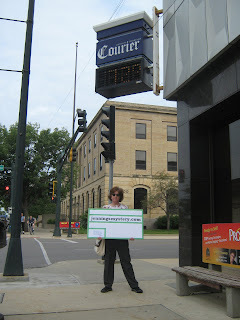 I stood outside the [Waterloo-Cedar Falls] Courier for about an hour, after I let them know inside that I was outside. Pat Kinney from the newsroom came out just as a friend of mine was taking my picture, and he (Pat) and I talked awhile about 9/11 and Barry Jennings and the whole truth movement and the desire for a new investigation, etc. I gave him some deception dollars, too. The publisher of the paper also came out, introduced himself and gave me a bottle of water, but he was off to a meeting and didn't have time to chat. A couple of people asked me about the sign. I'll put it up in my front yard in Cedar Falls, and a lot of people will see it. I live at a busy intersection. 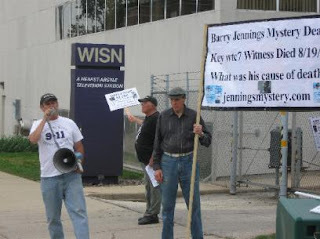 David Slesinger (Washington, DC): I arrived at the Washington Post before noon on Aug. 19, 2009, the anniversary of Barry Jenning's death, and unfurled our shorter, five-foot banner because we had to be perpendicular to the sidewalk foot traffic. Matt Skarlatos joined me at about 12:30 p.m. Earlier, at about 12:20 p.m. I recognized editor and famous Watergate journalist Bob Woodward approaching. 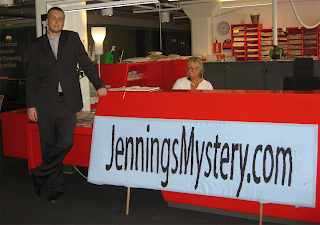 "Mr. Woodward, check this out my brother," I said as I handed him a narrow slip of paper with "JenningsMystery.com" in large text. He took it and kept walking. During the hour and a half we were there, we had conversations with about half a dozen journalists including one editor of an engineering journal. This was the first of the three times I had bannered at this location that security did not hassle me. At about 4:00 p.m. Matt and I set up with a longer, ten-foot banner at the Newseum, the preeminent museum of journalism. 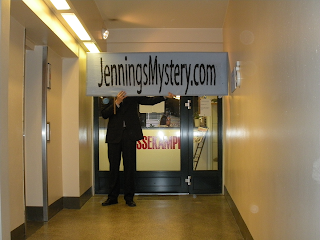 We used a collapsable rod so the banner could be held by one person, allowing the other to hand out fliers. I used the pitch, "You like mysteries, don't you?" Most families leaving the museum took a flyer. We gave out about 75 flyers in the 45 minutes we spent there. I told a tourist from Calgary that we were doing this all over the world today, but that the only city in Canada we were bannering was Calgary. She appreciated hearing that. Today is a sacred moment. 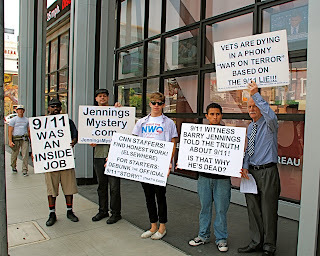 8/19/09 is the first anniversary of the death of NYC 9/11 martyr Barry Jennings. He worked for the City of New York. He was Deputy Director of the Emergency Services Department. He was in WTC Building 7 on 9/11, and he saw too much. His death has never been explained, let alone investigated. There is no story on his mysterious death at the NYTimes.com. We Demand Transparency! and other 9/11 truth groups are doing a "bannering" outside the New York Times today. I would like to see if you would cordially allow me to hand you some documents, today, anytime between the hours of 12:30 and 4:30. I am a friendly, professional guy. I have worked as a journalist for New York Press, Alternet, Catholic Worker, and others. I know the 9/11 story pretty well. The New York Times has been deficient in its coverage of the massive, global, movement asking for a real investigation of the 9/11 attacks. Currently in New York State Supreme Court, the NYC Coalition for Accountability Now is struggling to get the 9/11 investigation referendum on the ballot. Let's use this day of mourning to turn our tears into gladness. Let's go from death and mystery into light and truth. 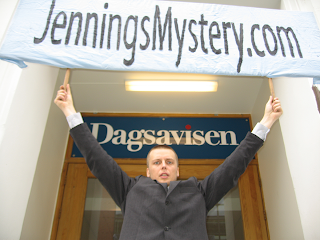 Jennings lives on in videos made by good independent film-makers, and posted online. 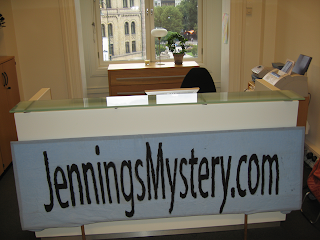 Jennings is prominent in the History Commons 9/11 Timeline, online, a credible source used by Emmy-award winning reporter Peter Lance, and others. So, why no Barry Jennings story in the Times? 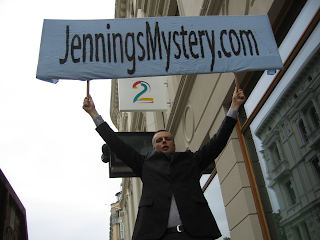 Investigate Jennings' Death. Investigate 9/11. Zan Overall (Hollywood, CA): Some twelve people showed up to take part in this national tribute to Barry Jennings. The hope of the organizers is to induce media to cover the story or at least be aware of it in their heart of hearts. That assumes they have hearts. I know that the CNN Hollywood office was aware of our demonstration. A "suit" came down and talked to some of us, in a very genial way. I got the impression we amused him. "Hollywood characters!" At least he is more aware of Barry Jennings than he was before. He took pictures. He came over to me and said "That is the sign I really want to get a picture of." It was one I made last night that read: "CNN STAFFERS! FIND HONEST WORK! (ELSEWHERE) FOR STARTERS: DEBUNK THE OFFICIAL 9/11 "STORY!" (IT'S EASY!)" 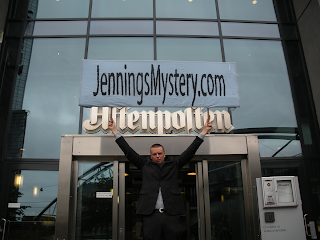 Oslo, Norway: Local 9/11 Truth activist tours the newspapers. 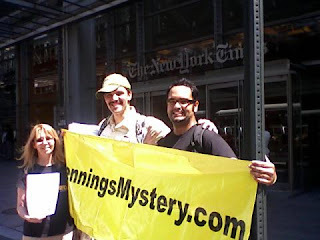 On August 19th, 2009, four people made an appearance in front of the offices of the Post-Star of Glens Falls, N.Y. I showed up to cover the event for Peter's New York, and the resulting article with pictures can be found at www.petersnewyork.com. How do I get my hands on one of those signs? I'm unemployed and live in NYC, and I would be glad to hold up that sign at 30 Rock or CBS, or down at Ground Zero. What the hell? I'm not likely to find work anytime soon, might as well do something posititve for the cause. I visited that web in the picture, but I doesn't understand anything. So, I need help to read all that things, because the topic is confuse and nobody care about that.